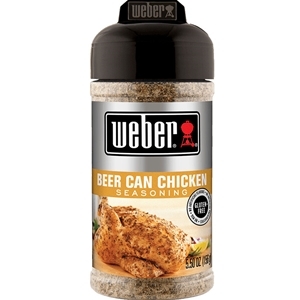 Inspired by that marvel of cookout ingenuity, we found the perfect complement: a simple seasoning to give your chicken an herbal crispiness on the outside and mouthwatering, bathed-in-beer flavor throughout. It’s so tasty, the beer can is optional: it’s a great, savory mix for turkey and pork chops, too. Salt, onion, garlic, spices, sugar, red bell pepper, lemon peel, citric acid, paprika extractives (color), and natural flavor.